Bought 2 PAYG SIMs from 3's shop in the Victoria shopping centre, Tunbridge Wells for the kids as the "123" 3p/minute, 2p/text, 1p/MB tariff looked attractive. This is mostly for emergency use with the deal being I put £5 on a month and the kids pay for extra if they want to yabber with friends. To this end I value a simple "no bundle" tariff that they (and me!) can understand the true value of each minute, text and MB of data. 9am - action time! Put one SIM in my son's unlocked mobile. Powered up and "bang": received a text message saying "...we're doing some essential maintenance work" and to try again later. This went on until after after 2pm. Restart the phone, and each time I get a fresh identical text message. It's not just me - Twitter is alive with the same complaint all over the UK. So I went back to the same shop in Tunbridge Wells. Showed the chap in the shop the problem - and by now I really was not happy. I should add, my displeasure was obvious, but I never shout or swear at shop staff. But I cannot promise to be fawning and happy when I've just been messed about all morning. Did I get an apology? Nope. He said "everyone thinks it's my fault it's broken. It's not." No apologies. So off he goes to talk to his colleague. Comes back and says "You'll have to call customer services". I replied: "Can you give me a new SIM - it says this one is broken and to come in here?" After another word with his colleague, he said "Yes, you can buy a new SIM for £1 and claim a refund on the other one". "But we cannot just give you a SIM". At this point I left in a major huff. Talk about failing on every single point of customer service, all for £1's worth of SIM. As for me, I am fuming and this will not rest. Have been on the phone to 333 (Customer Services) for 19 minutes. Every menu option takes you to another automated message. The only way I found to speak to a human was to select sales. That person was at least apologetic and said the entire billing system was broken most of the day. But he still had to transfer me to customer services. Finally - customer services... Let the games commence! After giving details of the broken SIM, the chap confirms it and asks if I'd like a new SIM. "No thank you" I said, I want my £1 back. "I'm sorry", he said, "you need to go to the shop for that". 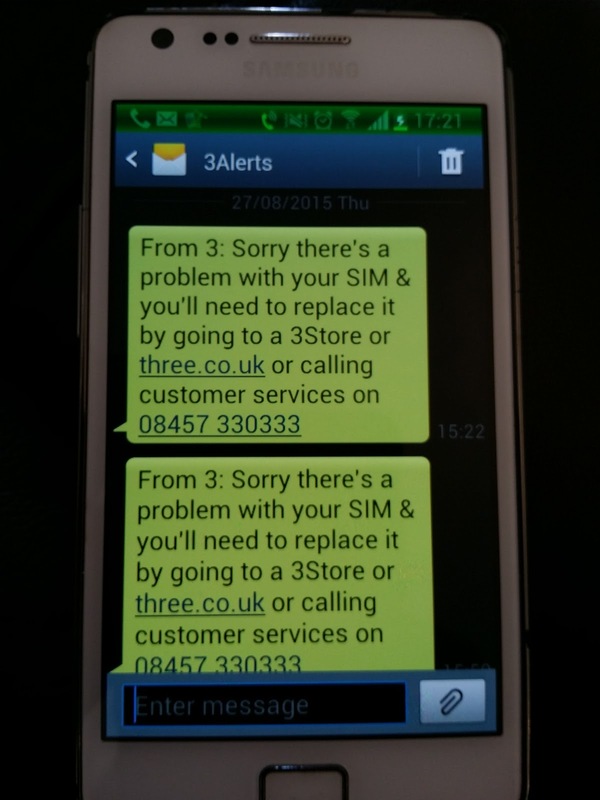 "I've just been to the shop and they said they could not replace the SIM and they did not offer a refund. They said I had to call customer services. So I am not prepared to be a ping pong ball any longer..."
Once he realised I was serious, he offered to credit the £1 back to another number with Three. As it happened the other SIM I bought worked so I asked for the credit to be put there. Still on with the customer services bloke. Now raising a complaint about the appalling (lack of) service in the Tunbridge Wells shop. Finally all done. £1 will be credited back to the other SIM. Complaint about appalling service at shop is registered. I left Three 1 1/2 years ago as their network, that used to be pretty good, was degrading in the places I needed. The signal was fine, but data was very slow - it felt like the data channels had too much contention. 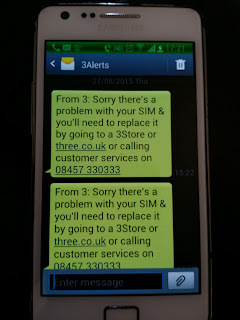 Having been with EE since, I thought it might be reasonable to see if 3 had improved their network. It's hard to say as I've only just got on it. However, if they have serious unplanned system outages for several hours into the working day, and if the attitude of their shop staff are anything to go by, I am certain, that as soon as my top up voucher on the remaining SIM runs out, I will never touch their network ever again.